Dogs are so intuitive and kind, and it often makes them naturally helpful in many ways – both to humans and to other dogs! No matter what, they’re always there to help each other, as the dogs of pup Dad Sadanand Sahasrabuddhe prove! 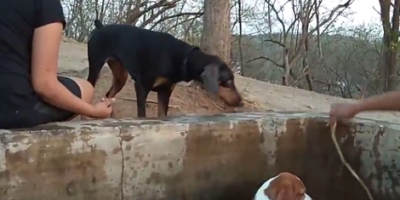 This beagle pup and his Doberman sister are out in a wooded area with their family. The beagle pup decides to go for a swim in a murky pool, but once he’s done, he finds that it’s pretty difficult for him to climb back out with the high walls around him. Luckily, his sister is there to help! She runs around the perimeter, trying to find ways to bring her brother back to dry land! The pups’ family watch and supervise as this touching scene unfolds. With assistance, the beagle pup is finally able to clamber out of the miniature body of water. What a lovely relationship these siblings have! This Adorable Pup Has Made It Clear He Just Wants To Relax With His Mommy!